Before you use the item, make you that you are careful while removing the product from its packaging. The blade is sharp that if you won't take extra precaution you'll definitely cut yourself. Just a heads up, didn't happen to me, but when I touched it and if I wasn't being careful I could have sliced my fingers. I washed the product first to make sure that before I use it, there's no chemical or whatsoever that is in it. Besides, it's been in the manufacturer's warehouse and we want to make sure things are clean before using them. It was pretty easy, all you have to do is to connect the head from its body and chopped off the crown part of the pineapple. Then make sure to put the Pineapple easy Slicer in the center of the cut pineapple and gently turn the knob down it until it goes further down. You'll find out when it's time for you to stop turning. Just pull the Slicer carefully and you are done. You'll definitely see the sliced pineapple easily comes with the slicer. Very quick too, I don't have to fill it off one by one and to make sure that I cleared the eyes too. A perfect circular cut just like the one in cans. I just got some fresh pineapple, because it is better than the canned variety. I would have to get one of those pineapple easy slicer. It makes it look like peeling pineapples is an easy task! I want one of these, I have been wanting to buyone. I know a few people who would would love to have this! I think it's a cool gadget. Oh, I like that pineapple corer. I need one like that. 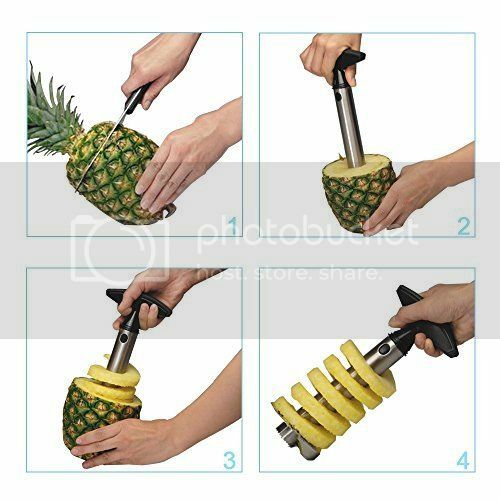 I love pineapples, but I find it tedious to buy the whole fruit, peel and slice, but with this gadget around, I think I'll buy pineapples more often.